Another finger citron group is in the Hartman Collection, illustrated by Robert Kleiner, op. cit., no. 203. Cf. also the group included in the exhibition, Minor Arts of China, IV, Messrs. Spink & Sons, London, 1989, illustrated in the Catalogue, p. 124, no. 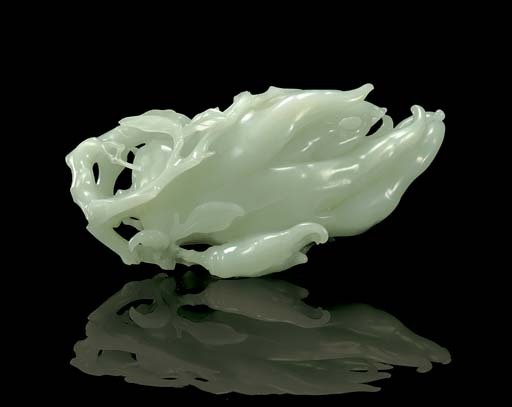 174; and a slightly larger celadon jade one illustrated by Roger Keverne (ed. ), Jade, London, 1991, fig. 94. Jade carvings of this fruit are also found hollowed as vases, for example, a pale celadon jade vase from the Victoria and Albert Museum, included in the exhibition Chinese Jade Throughout the Ages, Oriental Ceramic Society, 1975, Catalogue no. 406; a white jade example from the Metropolitan Museum of Art, New York, illustrated by Geoffrey Wills, Jade of the East, New York, 1972, fig. 65; and a large yellow jade vase from the Palace Museum, Beijing, illustrated in Jadeware (III), The Complete Collection of Treasures of the Palace Museum, Hong Kong, 1995, pl. 52. This naturalistically carved form is also called a 'Buddha Hand'. Although inedible, the fruit has a strong citrus fragrance which is often used for scenting rooms, and for offering at the Buddhist altar.